Recently, a few ahead-of-the-curve healthcare organizations received incentive payments through the HITECH Act. By meeting stage 1 meaningful use criteria, they cashed in on the federal government’s plan to award as much as $27 billion over the next 10 years for successful EHR adoption. Initially, the drive to meet meaningful use criteria would seem to have little to do with medical transcription. Doesn’t almost every physician record vital signs and medications? But read the criteria more closely. (View the chart here: http://healthit.hhs.gov/portal/server.pt/document/876940/meaningful_use_matrix_07162009_pdf) The key words from a medical transcriptionist’s perspective are “structured data,” information that is broken down into discrete, searchable elements. How do medical transcriptionists (MTs) who are already editing documents processed through a speech recognition engine create structured data? And how does it affect their workflow? Or does it mean the end of free-form dictation and transcription altogether? 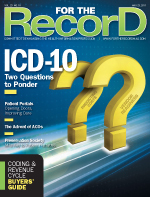 Some physicians are opposed to the idea of eliminating free-form text in a medical record. They claim a point-and-click system—or one that features only data elements—does not tell a patient’s entire story. Other physicians have commented that the items on the criteria list for meaningful use are not typical of the type of information their offices normally collect. For example, how many times do patients have their height and weight measured by an ophthalmologist? What does it mean for the medical transcription industry? Data elements must be identified and tagged, and point-and-click systems will do this automatically. This information could also be analyzed and tagged by either a computer or an editor. Natural language processing, on either the front or back end, can tag data throughout a document. • The U.S. healthcare system produces 1.2 billion clinical records each year. • Sixty percent of all clinical notes are documented via dictated narrative. • No documentation method preserves information-rich, complex patient stories better than narrative capture. • Narrative dictation is still the preferred documentation methodology of providers. The AHDI makes the point that without narrative, a good deal of a patient’s story will be lost, resulting in incomplete histories and increased potential for substandard care. Expanded EHR use has brought medical scribes into the spotlight as physicians leery of typing while seeing a patient turn to others to perform the task. Scribes enter the exam room with the physician and record the encounter in real time. In many instances, scribes are not merely checking boxes; they are creating a narrative within the record based on the physician’s and their own observations. To reflect the changes occurring in the transcription industry, MxSecure has begun providing clients with an electronic record. Through customer feedback, CEO Colin Christie learned 80% of physicians preferred to dictate—“It’s a time-tested solution,” he says—and point-and-click methods were a barrier to patient interaction. A solution was needed to help soften the transition to an electronic record. While integrating with speech recognition technology, MxSecure’s system tags the data elements on the back end. The data are then sent to an MT who can validate the report and confirm the tags are placed appropriately. “This uses the knowledge the MT has to be sure things are where they are supposed to be,” Christie says. EHR vendors often tout the savings that can be realized by eliminating transcription, but it may come at the cost of lost narrative. In a point-and-click scenario, healthcare professionals run the risk of routinely checking off questions in an effort to complete the record in a more timely fashion. Most significantly, this kind of system typically does not have the safety net of a transcriptionist being able to perform quality assurance. As more healthcare organizations make the switch to EHRs, it’s imperative to address documentation quality. It would be foolish to rely solely on a point-and-click system to capture a patient’s story while investing millions of dollars on technology. Transcriptionists must make it known that their skills add value to this process and that it is partly through their work that a clearer picture of a patient’s medical history emerges. — Kathy Nicholls, CMT, AHDI-F, is a consultant who assists clients with HIPAA compliance issues. She is author of Stedman’s Guide to the HIPAA Privacy & Security Rules and operates the HIPAA4MT and the MT Tools Online websites.